In a less-than-expected turn of events, HTC has decided to unveil its new series of phones unusually early, starting with two new devices: The flagship U Ultra and the more affordable U Play. 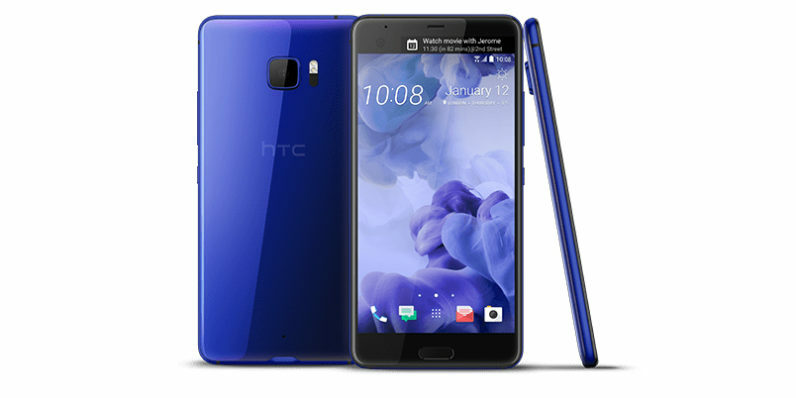 Moving away from its signature aluminium unibody design, both handsets sport a glossy, all-glass body which HTC built using an innovative approach it calls Liquid Surface construction, designed to give the phones a fabulous reflective look. Besides its revamped appearance, perhaps the most striking detail about the new U Ultra is the addition of a miniature secondary display on the front. The Dual Display technology essentially gives users quick and effortless access to their favorite apps and contacts, but can also be modified to show reminders and notifications. While the 2.0-inch mini-display comes with a resolution of 160×1040, the Ultra touts a 5.7-inch primary LCD screen with a resolution of 2560×1440. Crammed inside the handset are a Snapdragon 821 processor, 4GB of RAM, 64GB of storage plus a MicroSD slot and a slightly underwhelming 3,000mAh battery. There’s also a fingerprint scanner integrated into the home button underneath the main panel. The phone also sports a 12 MP rear camera with optical image stabilization and HTC’s Ultrapixel sensor, as well as a standard front camera with an impressive 16MP resolution. Much like the HTC Bolt, the U series abandons the standard headphone jack in favor of a unified USB-C port, but keeps the company’s trademarked “BoomSound” speaker technology. The phone-maker has also introduced its new Sense Companion which is HTC’s own take on the digital assistant. The solution will support various integrations with the secondary display, allowing for voice and touch interactions without powering up the primary screen. The less ambitious U Play retains the styling of the U Ultra but ultimately comes with a downgraded 5.2-inch 1080p LCD screen and no secondary display. While all models will pack a MicroSD slot, the handset will be available in various configurations of storage and RAM, including 32GB/64GB and 3GB/4GB. It will also come with a less powerful MediaTek Helio P10 processor. The Play features a conventional 16MP rear camera with a F/2.0 lens, which is mirrored on the front-facing module. Unlike the Ultra, however, it drops the UltraPixel sensor as well as the optical image stabilization functionality. In terms of software, both devices will be powered by Android 7.0 with similar custom features and functionalities. While the U Play is slated to hit the shelves in early 2017, there’s no mention of the price, but chances are the phone will fit between the $400-500 range. The U Ultra will be available for pre-orders on HTC’s website later today at a starting price of $749, with plans to start shipping later in March.